20.1 And in case of an emergency? 20.2 What if I want to come early or stay late? 20.3 What weather should I expect? 20.4 What is the Czech currency? Mozilla Europe is organizing a large two-day Mozilla conference in Prague, Czech Republic, 3-4 Oct, 2009. The conference, officially called "Mozilla Camp Europe 2009", aims to bring together Mozillians (staff and community members) from 4 main areas - DEV, l10n, Advocacy and QA - with a special focus on Europe. NB: due to limited space, the Prague DevDay is primarily for the general public living in and around Prague but Mozillians are more than welcome to participate. The DevDay is an event aimed at presenting the Mozilla project to open source enthusiasts who are interested in learning more about Mozilla. The L10n tracks and QA tracks will consist of sessions/workshops/brainstormings/lightning talks all related to localization and quality assurance. The DEV tracks will encompass different sub-areas (eg. Firefox, Thunderbird, Fennec; Add-ons, Labs etc..). To define track topics and their format, "track leaders" have been identified and have been asked to brainstorm with their teams and active members of the Mozilla community on topics they would like to tackle and the participants they would like to invite. Here is the final schedule subject to possible last minute minor changes. A pgp/gpg key signing party will take place Saturday during the coffee break. You can consult the participants' list. Attendees are encouraged to fill in their description. Please note that the Mozilla Camp Europe is open only to registered participants. Registrations are now CLOSED. The Mozilla Camp will be held at the Andel's Hotel in Prague (see map). This is also where participants will be staying. NB: Please do not confuse with the Hotel Andel which is a completely different hotel! The morning keynotes will take place in the Main Room which is essentially made up of 4 smaller conference rooms. After lunch, the Main Room will be broken up into the Opal, Topaz, Quartz and Sapphire rooms. Each of these rooms can fit up to 50 people. The Sapphire room can be broken up into 2 smaller rooms : Sapphire A and Sapphire B, each fitting up to 25 people. All the conference rooms will be equipped with WiFi, flipcharts, a projector, microphones, pens and paper. Speakers/session leaders should contact William Quiviger (william at mozilla com) or Irina Sandu (isandu at mozilla dot com) at least 24 hours before their session if they need any specific equipment or materials. Each conference room can have its unique layout (eg. theater, classroom, u-shape, cocktail, banquet etc...). Please notify William Quiviger (william at mozilla com) or Irina Sandu (isandu at mozilla dot com) if you want a specific layout for your session. All travel and accommodation costs for participants Who have received a personal email invitation by Mozilla Europe will be covered by Mozilla Europe. All invited participants will be staying in the Andel's hotels. An email containing detailed information on their hotel will been sent to each invited participant after registration. Participants flying to Prague are asked to contact Mozilla's European travel agency as specfied in the email they receive after confirming their registration. Invited participants who are traveling by train or bus are asked to purchase their own tickets. Mozilla Europe will fully reimburse them the week following the Mozilla Camp. For those sponsored participants who have purchased their own travel, please fill in the Mozilla Europe expense form and send it to William Quiviger (william at mozilla dot com). Also, please make sure to send William a scanned copy of ALL receipts relevant to your expense form. Sponsored participants will get full reimbursement via wire transfer. Participants will be asked to share a double room with twin beds. Participants who do not wish to share a room are free to stay in a single room but will be asked to pay for a percentage of the cost of their room. You can find the Prague metro map here. Mozillians arriving by plane on Thursday from 14:00 - 22:00 or Friday from 07:00 - 22:00 can go to the travel information booth in Terminal 1 of the Prague airport where to pick up a free travel ticket. The booth (see photo) is located in the main lobby of Terminal 1, near the hanging blue plane (see photo). Once at the booth, please tell the booth attendant that you are from Mozilla and going to Mozilla Camp and you will receive a travel ticket that you can use to go to the hotel. The ticket is valid for both bus and metro. You need to validate it in the bus and it will be valid for 75 minutes, which is enough time to get to the hotel (you don't need to validate it again in the metro). 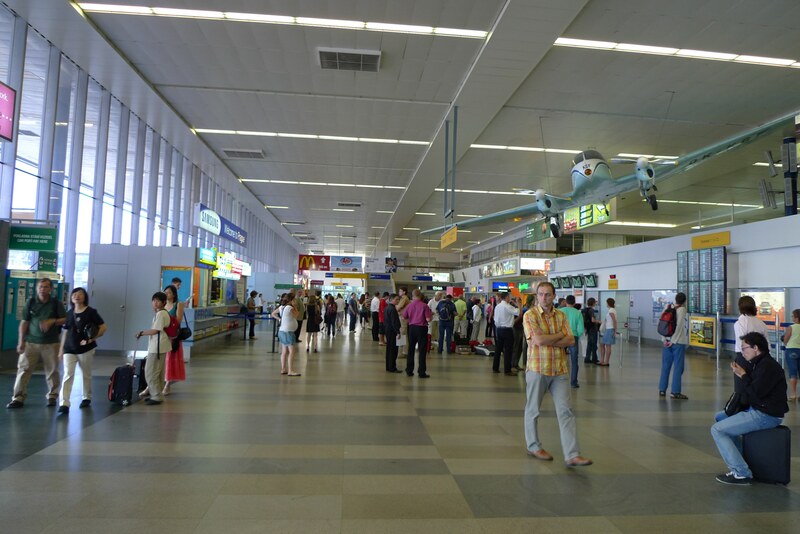 The bus station is near the Terminal 1 main exit. 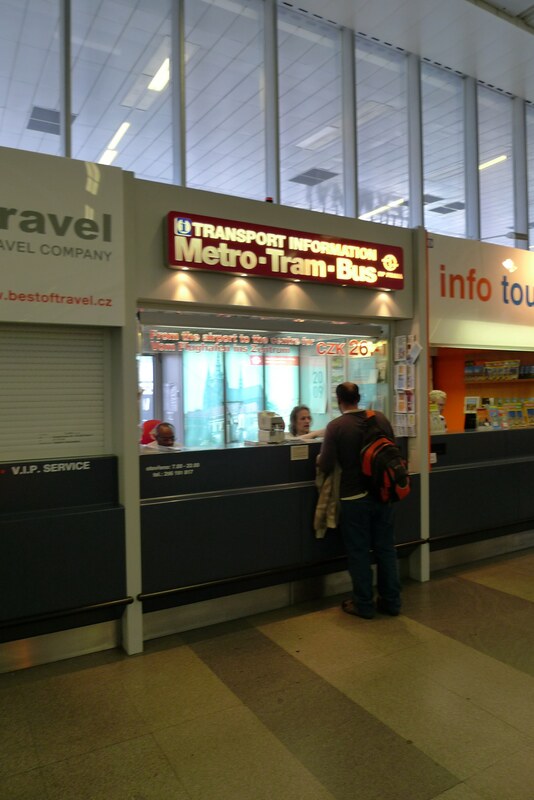 If you arrive at Terminal 2, please go to Terminal 1 to get your travel ticket and exit to the bus stop. There are different ways to get to the Andel's hotel from the airport. 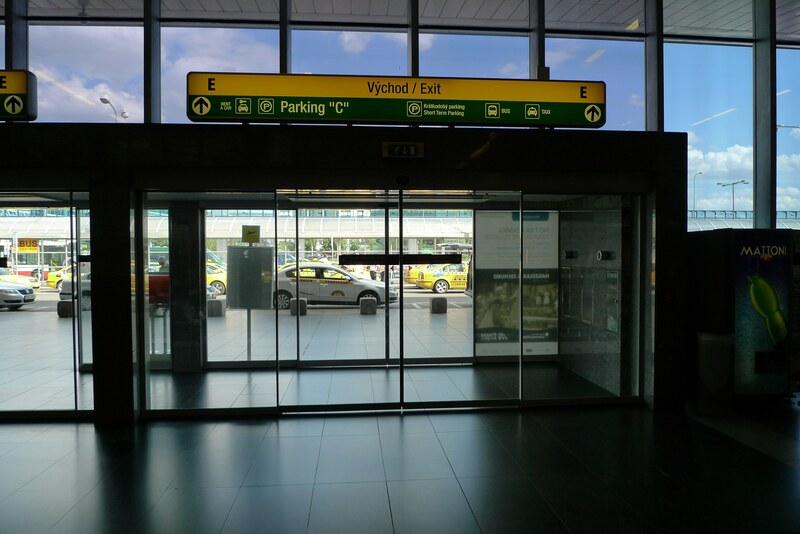 If you have a travel ticket, the easiest way is to walk to the bus stop in front of Terminal 1 (facing gate D, behind the taxi lane ) and take Bus 100 (see photo) to the station called Zličín. Get off the bus, and take the metro (line B) until you reach station Andel. The hotel is only 5 minutes on foot from Andel's station. When you get off the train, take the "LEFT" exit (see photo), go up the looooooong escalator then take the left exit with the escalator. Once you're out, look for the street called Stroupežnického and walk it down a few hundred feet. The Andel Hotel should be on your left (there's a huge sign, you can't miss it). The total journey Airport - Hotel should take you 45 minutes. If you arriving in Prague by train at Praha-Holesovice or Hlavní Nádraží station, you can go to the hotel by metro. You need to take line C to station Florenc and switch to line B, direction Zlicin, which will take you to Andel station, which is 5 minutes from the hotel. You need to buy your own metro ticket, which costs 26 Kr (= 1 EUR). 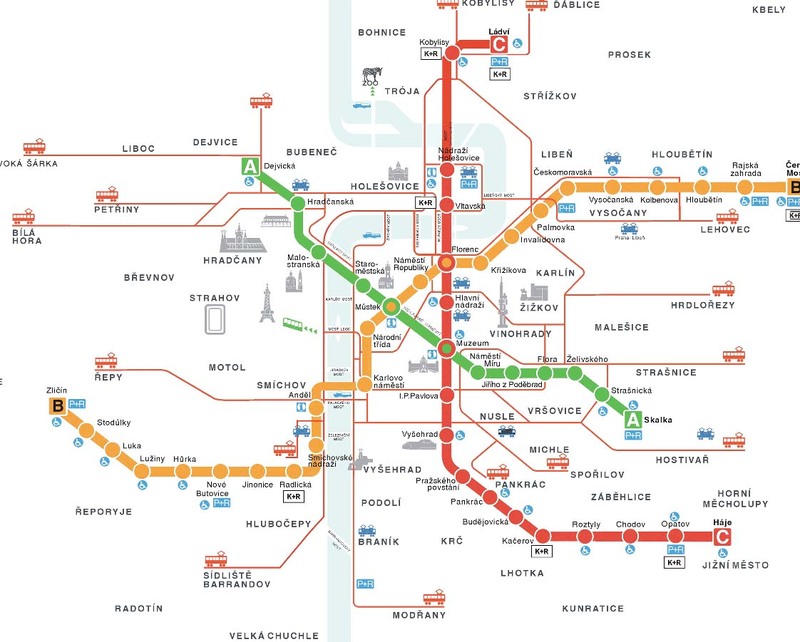 You can find useful information on Prague [here] and a journey planner [here]. If you prefer taking a taxi, the journey costs about 20-25 EUR and takes 20 minutes. When you arrive at your hotel, you should proceed to the check-in desk where you'll be given a pass-card to your room. Use Friday as a day to relax and get used to your surroundings, as we start first thing Saturday morning! You will be asked for a credit card as a deposit against damage and room charges; attendees are responsible for all room charges such as room service, pay per view content, minibar charges and any damage. If you don't have a credit card, please contact William or Irina. You will get your welcome pack at the registration booth on Saturday morning near the breakfast restaurant. Please note, check-in starts at 3:00 pm and check-out time ends at 12:00 pm. If you arrive earlier than 3:00pm or if you're leaving after 12:00pm, you can ask to leave your bags at the reception. You can see more pubs on a special map here. The Andel metro station (line B), tram (lines 4, 6, 7, 9, 10, 12, 14, 20 and during the night 54, 58, 59) and bus stations are just 2 minutes away from your hotel. To get to your hotel take the metro line B and get off at station Andel. The hotel is only 5 minutes away. FuzzyFox is attempting to sort out some unofficial transport back to the airport however nothing is guaranteed. There may be a minibus that will get you to the airport in 20 minutes and in time for your check-in if enough people are leaving at the same time. This transport will not be free however will be very cheap. Visit this etherpad if you are interested. If you are after a shuttle on Monday please come and find FuzzyFox or fill in the etherpad page with the requested information. Shuttles will be booked at 5:30 on Sunday and people who book a shuttle MUST NOT change to another mode of transport to the airport without informing William Q. We ask that those who have booked turn up so as to avoid changing the prices. The best way to move around Prague is the public transport. Metro trains run from 5 a.m. till midnight in 2-3 min. intervals during peak hours and in 4-10 min. intervals in the off hours. The time elapsed from the moment when the previous train left the station can be seen on the clock at the head of the tracks. To get to the center of Prague, take the metro Line B from the Andel station, which is near your hotel and get off 3 stops later at station Mustek. You will be in the heart of Prague. All meals and coffee breaks will be served at the Andel's hotel. Any other food or drink expenses (including room service and in-room minibar charges) are at the expense of the attendee. On Saturday night, Mozilla is organizing a dinner on a boat, which will take you on the beautiful river Vltava and show you the most amazing sights of Prague. The journey will start at 19:45, when everybody is asked to meet in the lobby of the hotel (PLEASE BE PUNCTUAL). From there we will go on foot to the nearby Andel tram station, where we will get on historical trams to go to the dock area. The trams are not part of the public transportation system, they were rented specially for the Mozilla crew. After a 25 minute ride, we will board the [Sumava ship], where we will have dinner and drinks and enjoy the beautiful sights in Mozilla style. A local guide will inform us about the city's historical buldings and culture. The boat ride will take approximately 3 hours, after which we will be taken back to the hotel by buses reserved for the Mozilla crew. If you suffer from sea sickness, or feel unconfortable being on water, please contact William or Irina. Free WiFi is going to be available in all the conference rooms on Saturday and Sunday. The WiFi network will be called "EUMOZCAMP" and/or "andelshotel". All the hotel rooms of Mozilla Camp participants are provided with FREE LAN Internet access. An Ethernet cable is provided but there is only one cable per room. Internet access is 100% FREE but strangely, to go online, you must first choose a pricing plan then choose a number of units and then press on "Submit". That will connect you to the internet. Please use #eumozcamp09 to identify relevant content. The IRC channel is #eumozcamp09. And in case of an emergency? What if I want to come early or stay late? Please note that any costs (hotel, food, bus, etc) associated with an extended stay will be at the attendee's own expense. Weather in Prague can be a bit chilly this time of year, with temperatures between 15 and 20 degrees C during the day and down to 6-7 degrees C at night. Please make sure to take warm clothes as well as an umbrells, as it might rain. Also, for the Saturday night dinner, please make sure you have a warm jacket, as we will be back around midnight, when temperatures can be pretty chilly. What is the Czech currency? The Czech currency is the Czech Koruna. The most practical place to change your money is at the airport or train station, although you won't get the best rates. If you want to change money in the city center, we strongly recommend you change money in banks rather than small "Exchange" offices. This page was last modified on 30 September 2014, at 11:49.